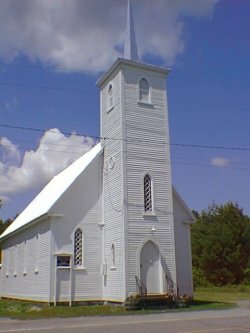 Holy Trinity in the small town of South Bolton was founded in 1860. Sunday services are on the first and third Sundays of each month at 9:15 am. The church closes for the winter months after Chritmas eve and re-opens at Easter. Holy Trinity is part of three-point parish with St. Paul's, Mansonville and St. Patrick's in Bolton Centre. The wardens are Margaret Bloomfield (450-292-5239) and Sheila Needham (450-292-5612).